Doyle Bruson was born in Longworth, Texas, a town with a population of approximately 100, and was one of three children in his family. Because of Longworth’s size, Brunson frequently ran long distances to other towns, and became a promising athlete. He was part of the All-State Texas basketball team, and practiced the one-mile run to keep in shape in the off-season. Although he was more interested in basketball than running, he entered the 1950 Texas Interscholastic Track Meet and won the one-mile event with a time of 4:38. Despite receiving offers from many colleges, he decided to attend Hardin-Simmons University in Abilene, Texas because it was close to his home. The Minneapolis Lakers were interested in Brunson, but a knee injury ended his playing days. He had taken a summer job and was unloading some sheetrock at work. When the ton of weight shifted, Brunson attempted to stop the shift with his leg out of instinct, but it landed on his leg, breaking it in two places. His leg was in a cast for two years, and the injury ended his hopes of becoming a professional basketball player. He still occasionally requires a crutch to get around because of the injury. Brunson changed his focus from athletics to education and obtained a master’s degree in administrative education. Brunson had begun playing poker before his injury, playing five card draw and finding it “easy”, and he began to play more often after being injured. His poker winnings paid for his expenses, and he obtained a bachelor’s degree in 1954 and a master’s the following year. After graduating, he took a job as a business machines salesman, but on his first day in the job he was invited to play in a seven-card stud game and earned over a month’s salary in less than three hours. He soon left the company and began a career as a professional poker player. 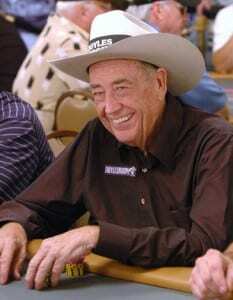 Doyle Brunson started off by playing in illegal games in Exchange Street, Fort Worth, and Texas with a friend named Dwayne Hamilton. Eventually they began traveling around Texas, Oklahoma and Louisiana, playing in bigger games, and met fellow-professionals Amarillo Slim and Sailor Roberts. Hamilton moved back to Fort Worth, while the others teamed up and traveled around together, gambling on poker, golf and, in Doyle’s words, “just about everything”. They pooled their money together for gambling, but after six years they made their first serious trip to Las Vegas and lost all of it, a six-figure amount. They decided to stop playing as partners but remain friends. Brunson continues to play in the biggest poker games in the world, playing $4000/$8000 minimum bets and also at the World Series of Poker. He won his ninth gold bracelet in a mixed games event in 2003, and in 2004 he finished 53rd (in a field of 2576) in the No Limit Texas Holdem Championship event. He won the Legends of Poker World Poker Tour event in 2004 (garnering him a $1.1 Million prize), and finished fourth in the WPT’s first championship event. Early in the morning on July 1, 2005, less than a week after Chan had won his 10th gold bracelet – setting a new record – Brunson tied the record by earning his 10th at the 2005 WSOP.